Every war, but especially God’s spiritual war, rages like a forest fire. A forest fire burns furiously until extinguished or all the fuel is spent. Wars burn furiously and uncontrollably until all the fuel is spent. A forest fire marches forward on all fronts, consuming everything in its path and leaves behind a changed landscape. Man’s war, waged in the natural realm, also marches forward on various fronts and leaves behind a changed physical world and a changed landscape. God’s war, waged in the spiritual realm, marches forward on various fronts and leaves behind a changed spiritual world, a changed physical world, and a changed landscape. Changed religious doctrines, canon, etc. Physical evidence, such as religious structures and buildings, demonstrating the above-described personal and social changes. By uncovering and tracing these vestiges of past battles and victories, we can piece together a fairly accurate historical picture of God’s spiritual war. But first we must understand how conflagrations such as a forest fire start, advance, and die. The forest fire starts small; perhaps as a single glowing ember that turns to flame and spreads out. The growing forest fire burns hot along its advancing front and sends forth many sparks. A single tiny spark may ignite a new conflagration far away or it may merely start a new, smoldering, smoky fire that slowly expands or ultimately dies. The more pure the fire’s fuel, the hotter, cleaner, and faster it burns and rapidly it advances. The more wet and poor the tinder, the smokier and less intense the fire and the less rapidly it advances, if at all. If firefighters recognize the danger presented by the fire while it’s still small, they first come against it by trying to scatter its fuel – as in the case of a small camp fire. Failing that they spray around and on the fire with water to contaminate the fire’s fuel and retard its progress. Then they attempt to crush the fire by stomping it out or burying it under non-flammable dirt. If the fire continues to spread unchecked, they try to create fire-stops by bulldozing the fuel away from the advancing flame-front. This is not very effective, however, because sparks and flames readily hop over the fire-stop. As a last resort firefighters may start back-fires to fight the original forest fire. Back-fires are controlled burns intended to destroy all fuel in advance of the forest fire, thereby containing and ultimately starving the forest fire to death. Every conflagration has a life. It starts small, catches strength, burns hot and strong; then it ultimately begins to run out of fuel, weakens, and becomes a smoldering heap of rubble. A smoldering fire is easily extinguished or ultimately dies a natural death. God’s fire started small with a single person of lowly birth and no political power. But the fire burned hot, strong, and fast. Within a mere 4 years it had ignited thousands of fervent believers. Within 400 years it had completely consumed the ancient world and swept away the entire spiritual order of Greek, Roman, and Middle East gods. But God’s fire didn’t stop there; subsequently it continued its advance into all parts of the world to become the largest faith on earth. But the enemy’s firefighting efforts are all to no avail. God will not be stopped until victory is complete. The war continues to this day: Wherever God’s fire spreads, the enemy is close behind with distraction, deception, and destruction. Nevertheless God’s fire inexorably moves forward. God chose to start His fire with an explosion in Jerusalem and then to drive the fire-front westward through Europe. (Act 16:6-7) The enemy immediately scattered the fire by persecution from Jerusalem. The persecution failed miserably; it caused new fires to spring up throughout the Mediterranean region. Subsequently God’s fire made its home in Rome and continued to spread throughout the Roman Empire. It continued westward relentlessly as the Roman Empire crumbled. Contrary to God’s plan, some early Christians took the flame Eastward, but all such human efforts languished and the fires merely smoldered awaiting God’s perfect timing. The farther west the flames went, the hotter they burned. The Reformation ignited in Germany, sending sparks to England. In England it found dry tinder that burned hot enough to send flaming hot sparks across the Atlantic Ocean. God’s fire exploded The New World into a conflagration fed by the settlers’ pure faith and opportunity to start afresh uncontaminated with a long history of false beliefs and traditions and unfettered by worldly institutions. That explosion in America subsequently sent the Gospel to be preached by missionaries throughout the world. God’s next great explosion has already begun in China. China will soon become the largest Christian nation, on fire for the The LORD. Chinese believers feel uniquely called to take God’s Gospel back to Jerusalem through Southeast Asia and the Middle East. The outcome of every war turns on a single decisive battle. Napoleon’s fate was sealed at Waterloo. Hitler’s fortunes stalled at Stalingrad. The tide of WWII in the Pacific turned at Midway. The decisive battle usually isn’t the last battle; it may not even be the largest battle. But after the decisive battle the final outcome of the entire war is no longer in doubt. Although the final outcome of the war is determined at this decisive battle, the battle’s significance may be difficult to perceive at the moment of conflict. In fact, its significance may not be understood until the war has receded far into history. So it is in the spiritual war between God and Satan. The decisive battle of that war occurred at Calvary when Jesus Christ the Son of God reconciled the irreconcilable: God’s perfect holiness was reconciled with man’s incurable sinfulness. Jesus, the perfect man and the perfect God, satisfied God’s righteous judgment by paying the perfect price of a perfect life to redeem and repair the imperfection caused by man’s fall. Through His blood Jesus purchased clear title and gained legal authority to make perfect that which Satan had illegally stolen, corrupted, and made imperfect. Through the Cross, and only through the Cross, can God’s holiness and perfect perfection be maintained. Through the Cross, and only through the Cross, could God execute the mandatory punishment of death for the sin of man and continue to retain His own holiness. Through the Cross, and only through the Cross, could God earn the legal right to restore to its original state that which had been stolen and corrupted by Satan. Therefore through The Cross, and only through The Cross, can God retain His own perfect perfection. The transaction that occurred at Calvary totally caught Satan by surprise, sealed the outcome of his rebellious war against God, and doomed Satan’s rebellion to failure. The fighting may not have ended – indeed in this case the fighting had merely intensified – but the outcome of the war is sealed: God wins. Satan loses. This animated map provides an outstanding visual history of the spiritual battle that has covered the Earth from 3000 BC to 2000 AD. The map illustrates a fire front that started in Jerusalem then marched westward through Europe, then the Americas; now it is passing through Asia on its way back to Jerusalem. The Gospel is now proclaimed in all nations and is making major inroads in traditionally hostile territory. The map underscores why, from a militarily strategic perspective, God chose to expand the war westward: (1) Hinduism and Buddhism to the East were well established and entrenched, providing a formidable barrier, (2) The world’s center of power was westward in Rome, (3) The route to a surprise attack on Satan in the New World lay westward. 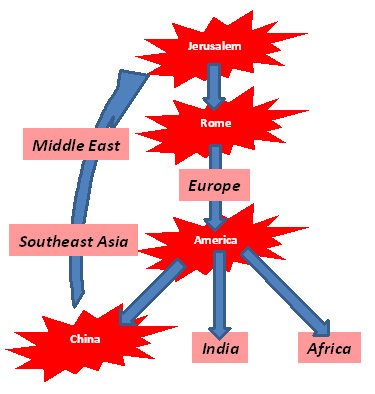 Notice how the flame of Christianity spread throughout the world from Jerusalem through Rome, to Europe and to America; then literally exploded into the whole world. Unfortunately the creators of the map do not include Satan’s modern back-fires of secular humanism, Communism, and atheism ignited in Europe during the 1800s. Had these back-fires been included in the map, they also would have been seen to chase the westward spread of the Christian flame. Christians are also geographically widespread – so far-flung, in fact, that no single continent or region can indisputably claim to be the center of global Christianity. According to the same Pew Research Center, there are an estimated 1.6 billion Muslims worldwide. Wherever God’s flame goes, the enemy’s firefighters are not far behind. Whenever God’s fire dwindles, the enemy’s firefighters efforts to quench it are redoubled. As Europeans and North Americans abandon Christianity in favor of secular humanism, they are left vulnerable to Islam’s aggressive expansion into Europe and North America. The University of Edinburgh provides an animated series of maps detailing the expansion of Christianity up to the end of the 20th Century. Their snapshot corresponds closely with the findings of the Pew Research Center. By contrast, God’s fire appears spent and losing strength to variations of Satan’s secular humanism throughout Europe and in North America. Islam is aggressively targeting Europe and North America as well and making significant inroads, especially in the last 40 years. So far we have focused on highly visible and terrifying forest fires, but there is another fire we must now consider: The underground peat and coal fire. These underground fires burn slow, burn hot, and burn long. They are virtually invisible and unstoppable until the fuel is spent. Often the only evidence one sees of such fires is smoke rising from underground. Then suddenly when conditions are ripe, the underground fire bursts to the surface and ignites a terrifying forest fire impossible to extinguish. God has unleashed just such a fire through an invisible guerilla war in the heart of enemy territory: That fire is The Underground Church. The underground church closely resembles the first churches in Apostolic times: Many small, semi-independent house churches comprised of personally affiliated, tightly knit believers. Each church is akin to a cell of combatants in a guerilla war. Each church is akin to a small peat and coal fire burning deep underground. The totality of these small fires, however, is overwhelming and unstoppable. The underground church is invisible, indestructible, and irresistible – even in the most hostile countries. The underground church is invisible because The Church requires no formal organization or physical structures: It requires merely a personal relationship with the living Savior, Jesus Christ, by each member. The underground church is maintained and nurtured through that personal relationship with Jesus and through the inter-personal relationships within tight cells of devout believers. Its tightly knit nature and structure makes it virtually impenetrable to the enemy. The original underground church of apostolic times didn’t merely exist and survive, but grew explosively in spite of extreme Roman and Jewish persecution. The underground church may disappear from sight but continues to exist through decades of persecution. For example, the Russian Communists unsuccessfully attempted to eradicate all vestiges of Christianity from society for over 70 years. Russian Communism is long gone, but the church is still alive. The underground church is alive after decades of persecution even in the most hostile of all Communist countries, North Korea. The underground church is thriving and growing explosively in China and India in spite of government and cultural resistance. But North Korea, China, and India represent merely the outer perimeter of the enemy’s defenses against the inexorable westward march of God’s fire. The heart of the battle is occurring in and around Jerusalem because The LORD God chose Jerusalem and Israel as His earthly headquarters. The enemy may have counter-attacked and forcibly taken physical control of portions of Jerusalem, The Promised Land, and surrounding areas through Islam, but not gained complete spiritual control. Israel’s existence against staunch opposition from all Muslims testifies to this fact. The political battles in the Middle East are like forest fires burning on the surface which the enemy appears to have successfully extinguished, or at least controlled. But they are not the only fires and battles. God has ignited an invisible underground fire, akin to peat and coal fires, in Islamic countries. Like a peat and coal fire, God’s underground fire is inextinguishable by the enemy. A peat and coal fire burns hot and fierce buried deep within the ground and is unreachable to firefighters. God’s invisible fire burns hot and fierce buried deep in the hearts of individual believers and cells of believers – the underground Church within Islam. It, too, is unreachable to enemy firefighters. Jesus Christ is personally waging an intimate guerilla war one individual at a time, preparing and softening the ground for the final onslaught. More Muslims are said to have turned from Islam to Christ in the past century alone than all other centuries combined. A deeper look at The Church, Her corruption, and Satan’s defensive strategies. A different perspective on an all-consuming fire. Chinese church leaders have a vision to complete The Great Commission by carrying the Gospel back to Jerusalem through Southeast Asia. Book: “Back to Jerusalem” by Paul Hattaway. The corruption of Creation presents a serious challenge to the character of God. After all, if Satan had been able to thwart God’s original intent by corrupting His Creation, then God is not all powerful. Furthermore, God then is made out to be a liar for claiming to be all powerful. Such a God would be neither holy nor perfect, contrary to His claim. “Although Europe and the Americas still are home to a majority of the world’s Christians (63%), that share is much lower than it was in 1910 (93%). And the proportion of Europeans and Americans who are Christian has dropped from 95% in 1910 to 76% in 2010 in Europe as a whole, and from 96% to 86% in the Americas as a whole. The fire is noticeably weakening.